At my 34th week checkin yesterday I met the last doctor in the practice. 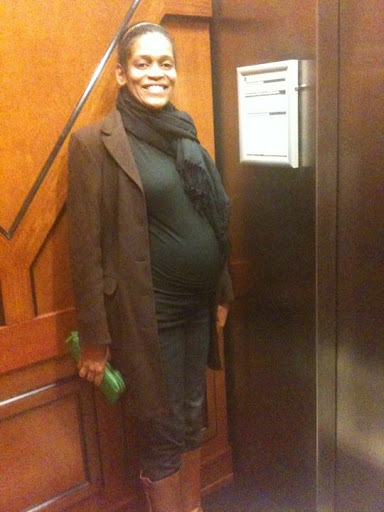 Dr. Kelli Carroll relly impressed me with her laid back demeanor and support of what Joe and I want during the delivery. That makes only one doctor that I really do not like in the practice. I think that isn’t too bad considering there are six of them in the practice. Hambone is on target size wise and is still head down. With my weight gains and losses I am at a total of 22 pounds gained in all. Hearing that good news I ate some Halloween candy and queso last night! I ended the evening with a salad so I am not completely bad. I am happy my body has been responsive to my small meal diet. The hardest part has been drinking enough water.I have tried twice during the last 8 months to eat big meals and have failed miserably. Both times ended in bad stomach aches and I remained amazed at any pregnant woman who is able to actually “eat for two”. Joe and I are the proud new owners of a Bob stroller. We are so excited about the thing it is sad. I have ordered the frame that allows us to put our Chicco carseat in it and we can’t wait to try it out.